Carlos Monroy was eating lunch in front of his computer when the word “tavola” popped up in his mind. The computer science research scientist was brainstorming a way of uniting his interest in data science topics with his research on improving learning experiences. That’s when the idea for the Data Science Tavola was born. “Tavola is Italian for table, and it illustrates the rich Italian tradition where meals are an important moment to encounter while eating and talking. Our goal is to turn data science discussions into moments of encounter where we can chat and exchange ideas about this emerging field in a relaxing environment,” Monroy said. The group started meeting in the Fall of 2017 at Duncan Servery where Monroy is an associate. Students from all colleges are welcome to join the discussions. 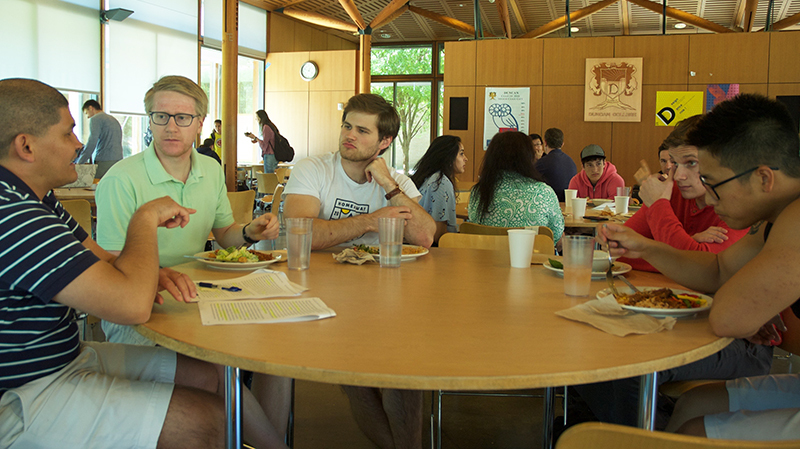 The casual atmosphere is perfect for the diverse group of students. Each week, students receive articles prior to the meetings so they can engage in the discussion. Gabe Tugendstein ‘20, a philosophy and evolutionary biology major, enjoyed the topic of data curation, data use in elections and big data analysis. “It’s a way to hit on topics that are both interdisciplinary and pressing. As opposed to learning in classes or even clubs, which are often goal-oriented, these tavolas are purely about the story we’re looking at,” Tugendstein said. “We can investigate it from different perspectives, some rather unorthodox, without fearing that we are ‘not getting what we need to’ out of it. Plus, Carlos is just an awesome dude, and effortlessly facilitates discussion through his knowledge and enthusiasm,” he said. The topic of bias and fairness in algorithms and artificial intelligence sparked interest in CS major Lucy Fox, ’19. “The article was really interesting. It’s fascinating how closely these issues parallel social issues and stereotypes in humans,” she said. Zach Gramstead, ’18, a CS major, said the discussions provide context and perspective to technical concepts. “The data science discussions have filled a hole that was missing in my college experience. While I do have intellectually stimulating discussions with peers, in STEM fields like computer science, the focus is on the “how” more than in the ethical implications and real world consequences of decisions,” Gramstead said. “Being able to sit back and discuss the big picture while relating these topics to my own personal experiences provides a context and perspective to the technical aspects of data science that I would not have otherwise. Also, the talks are just fun! I have really enjoyed getting to know Carlos through our lunch discussions. I really appreciate his love of learning and his eagerness to share his passion with us,” he said. Peter Tang ‘18, a bioengineering major, hopes the group will help shape his future decisions. “What I get out of the group are perspectives that are not necessarily technical but very important for the future of data science,” Tang said. “I broaden my perspective on the topic and hope that this knowledge will help me make the right technical decision in building machine learning algorithms in the future,” he said.